The Harper sofa is sturdy yet comfortable combining natural materials, wood and leather. With its leather webbing the design brings a subtle feeling of 50’s furniture to modern age. 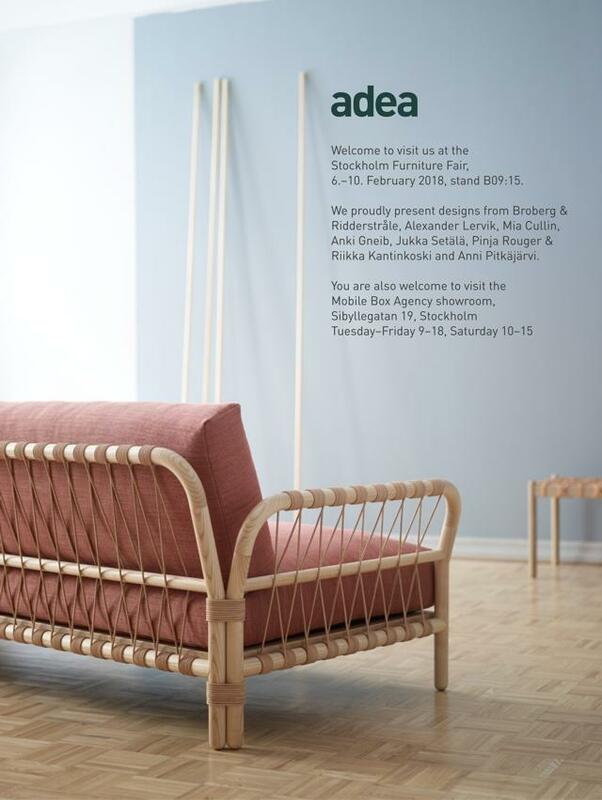 The sofa was on Lervik’s drawing board almost for ten years until he began cooperation with Adea, only then the right kind of manufacturer with experience and know-how was found. The round Harper sofa table consists of simple and clean forms giving room for detail. Material is ash, the same as the wooden frame in Harper sofa. Fay is a light armchair with a woven leather seat and wooden frame. The weaving of the seat derives from and is inspired by belts and bags from the seventies. The elegant chair can be used as a solitary or in a number of pieces in homes, hotel lounges, restaurants or meeting areas. Napoleon is a family of seating ideal for lounge and hospitality settings as well as for the private home. The inspiration derives from the mathematical ”bicorn” curve also known as the ”cocked hat” curve – the hat made famous especially by Napoleon Bonaparte. Inviting chairs and sofas play with soft forms and sharp silhouettes, weight and lightness. “The idea behind Napoleon sofas and chairs is that design is playful, inviting and friendly. There are different shapes and sizes of products that can be combined in numerous ways in different settings”, says Anki Gneib. Bonnet Dining and Bar Chairs addition to the Bonnet seating family. Bonnet Club chair that was introduced in 2016, and it has been very successful. The range that has included neat Club chair and Sofa, now also includes an upholstered dining chair to meet the demand of higher comfort by the dinner table. The proportions and dimensions has been transformed and fine-tuned to make Bonnet in to the ideal dining chair for both the user and any environment. The sloped armrests makes it easier to place Bonnet Dining Chair by a table and gives the chair an elegant but relaxed look. Plateau table series has expanded to include new sizes and shapes. Continuing on the same design principal with the thin round legs carving its way in to the table top and an extra tray to enhance the design and function, the new versions include round and oval shapes in different sizes. O is a pendant lamp that resembles Finnish lake clam. Clam shell is very thin and fragile, so is O. The lamp’s shell is made out of round and very thin high grade veneer plywood sheets. In the heart of the lamp is white big light bulb. Plywood sheets are gently resting over the bulb.